The terms "farmers' market" and "growers' market" have only received widespread use in Australia in the last decade as a result of globalisation, so it is worth remembering that many long-established produce markets often consist of farmers and growers selling their own produce. 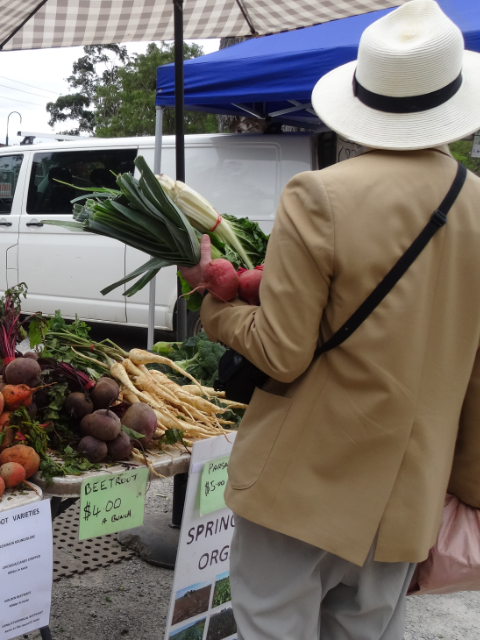 The listing below are those that label themselves farmers' markets - many other produce markets can be found in our listing of Markets in Victoria. Farmers' markets are opening and closing all the time, and we will mention newly opened farmers' markets in our free email newsletter about great things to do in Melbourne. At farmers’ markets you will find lots of calico bags and motherhood statements about saving the planet. Unfortunately they don’t always stack up. The grower who has driven half way across the state to sell a few bags of nuts or a few litres of olive oil is not exactly reducing their ecological footprint. Nor are the customers who drive from Melbourne to St Andrews Market in their 4WDs. If such things concern you then get to know the growers or speak to the organisers. The better ones have a code of practice about the nature of goods accepted for sale. If on the other hand you just want to buy some good fresh produce without having to feel too much holier-than-your-parents, then farmers’ markets are always a great places. It is also worth remembering that the current preoccupation with 'food miles' is a useful consideration when regarding whether a product is environmentally responsible, but forms only part of a complex equation. Is it more environmentally responsible to buy rice from a water-starved Victoria or to ship it in from a place where water is much more plentiful? Although the concept of 'food miles' is often adopted as a simplistic mantra it can often lead to the opposite result to what the well-intentioned buyer was trying to achieve, Fortunately, the quality media usually takes a more informed approach (read more) and looks past the single dimension. At farmers' markets you can get to discuss how the food is produced and the relative benefits to the environment. However, don’t overlook your local suburban market. Most of these started out as farmers’ markets a century or more ago which is why they still tend to operate only on certain days of the week. Markets like the Queen Vic, Prahran, Preston, Footscray, Dandenong, South Melbourne and others all have ultra-fresh produce if you shop around. The traders will often have been to the wholesale market in Footscray at 5 o’clock that morning and bought their stock direct from the producer. Some of the produce you will find on suburban market stalls was picked at 2am that morning. All of this could create problems for supermarkets who usually buy fruit and veg for appearance and shelf life and whose produce has sometimes been in cool store for up to a year. No problem really – you just take out television ads showing happy farmers, and call yourself ‘the fresh food people.. It works every time. Celebrate all that is sustainable, innovative, hand and homemade at the newest market in the region. Specialising in clothing and textile design, art and jewellery, fresh organic produce and tasty homemade food, the Moriac Makers & Growers Market is where quality and quirky come together. Imagine seeds and stitches, jewellery and jam, sewing mchines and local seasonal produce accompanied by live acoustic music to soothe and inspire. Here craft is cool and excellence is expected! Head to the hinterland and tap into some real country soul. Coming dates: 8th January 2012; 6th May 2012 ..
9am to 2pm, selected Sundays .. Moriac Community Centre, Moriac ..
9am to 1pm, selected Sundays .. Main St, Natimuk (20mins west of Horsham) ..
Farmers’ Markets have proved to be highly volatile with many lasting less than a year.